May has arrived at rugbystore HQ and brings with it some exciting new rugby gear as well as some signs of Summer weather. The European competitions will end this month and to celebrate we’ve got great deals on 2016 club kit at rugbystore.co.uk. Let us know in the comments who you think will emerge victorious in the Aviva Premiership and PRO12. You’ll also find big savings on rugby boots in preparation for a Summer of rugby. This Month in the Hot 3: Rugby returns to the Olympic Games, keeping cool down under and training balls with flair. After 90 years, rugby will return to the Olympic Games this summer in the form of Rugby Sevens. One of the fastest growing rugby codes, Sevens has grown in popularity thanks to it’s thrilling running rugby and the party atmosphere at it’s tournaments around the world. 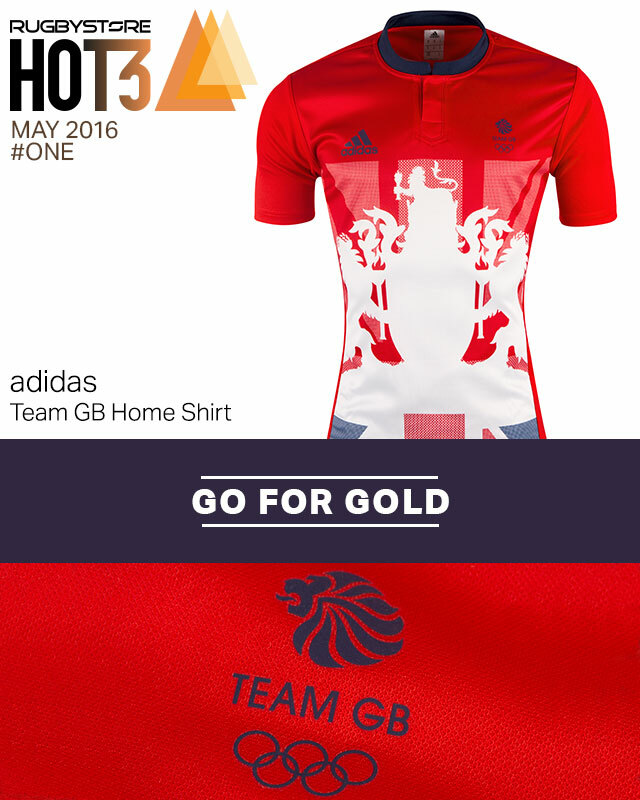 Now adidas have released the kit Team GB will be wearing during the Sevens in Rio and it is stunning. Designed by Stella McCartney, the striking coat of arms is sure stand out during the Opening Ceremony. Of course, being made by adidas means the kit is full to the brim with performance technologies. Climachill will keep the Sevens players cool even in the Brazilian heat and the top is lighter and better fitting than previous Team GB shirts. Head to our Facebook Page before May 10th for a chance to win this shirt! Designed to boost the performance of professional athletes, these boxers will make you reconsider ever wearing normal underwear during training or a game again. Thanks to the Coldskin fabric, these boxers can reduce temperatures in areas of excess heat build up by 5 degrees! They are extremely comfortable as well, cleverly managing to prevent skin contact plus they wick away moisture to keep you cool and dry. There’s no going back once you’ve tried the 2UNDR Power Shift Boxer shorts. Need a ball for a bit of beach or park rugby this Summer? Get something with a bit more personality thanks to these colourful graphic training balls from Optimum. Available in a range of sizes, Optimum have created a range of bright and interesting designs for their latest training balls. They are an ideal gift for any rugby lover and are perfect for a kick-about this Summer.